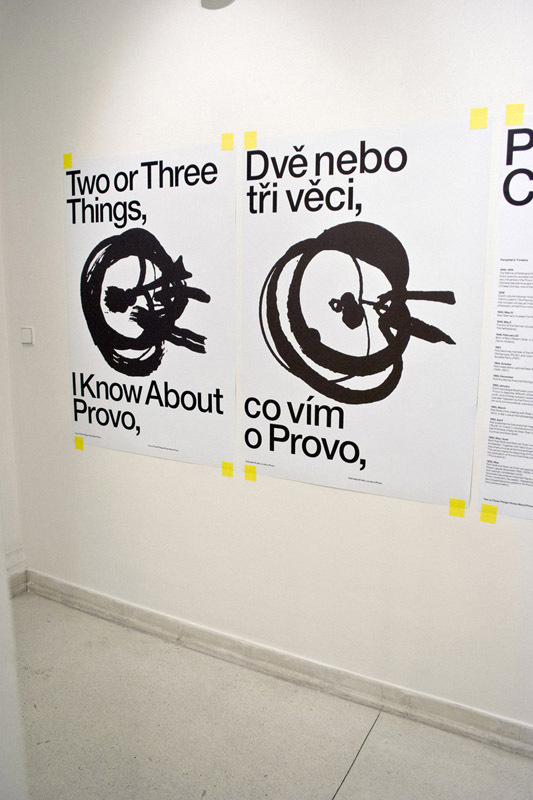 ‘Two or Three Things I Know About Provo’ is an exhibition that we curated, designed and installed ourselves, while we were also responsible for all the research and texts (and most of the translations as well). The subject of this exhibition is the Provo movement, including some of its post-Provo manifestations. 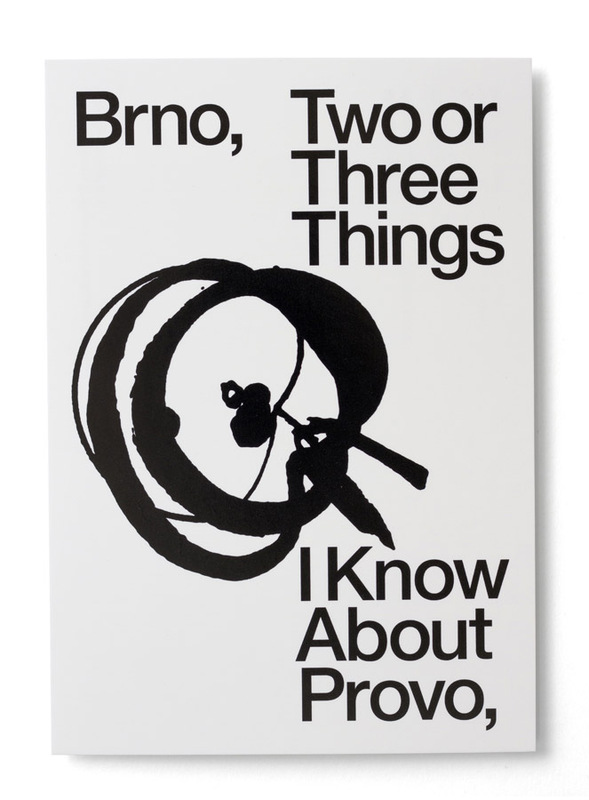 As we’re writing this, two editions of ‘Two or Three Things I Know About Provo’ have been held (so far). The first one took place in Amsterdam, between February 18 and March 13, 2011, while a second, extended version took place in Brno, between June 22 and October 28, 2012. In the text below we discuss the second edition of the exhibition – the one that took place in 2012. In short, Provo was an Amsterdam anarchist movement that existed for just two years (1965–1967), although its existence resonated for years to come, in the Netherlands and abroad. 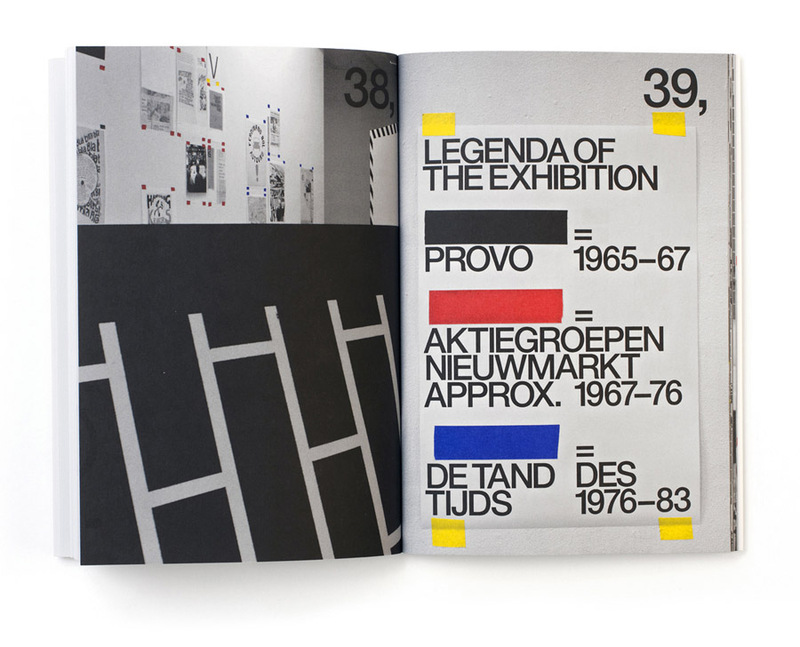 Through printed matter, conceptual activism and speculative political proposals (the ‘White Plans’), the Provo movement captured the imagination of a generation, and forever shaped the Dutch political and cultural landscape. 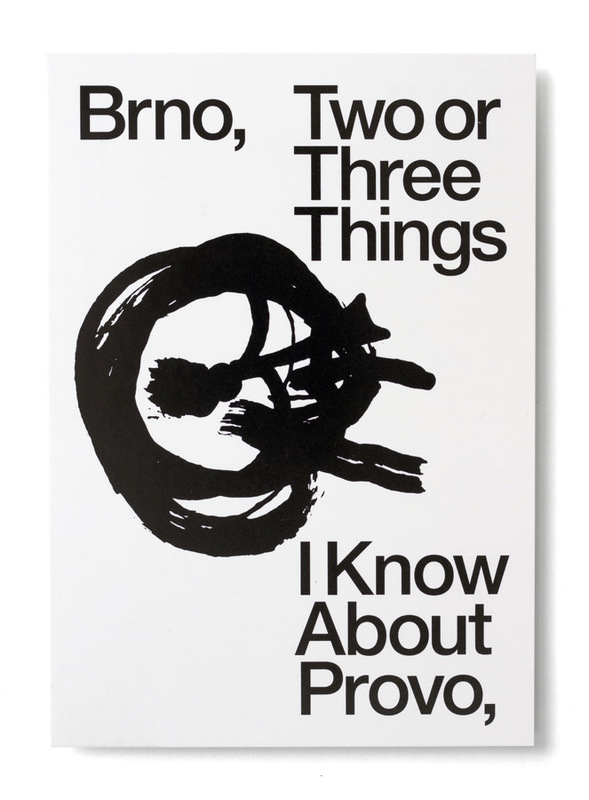 Part art movement and part political party, Provo was a loose collective, consisting of individuals with very different ambitions: subversive agendas, artistic motives, utopian ideas, concrete plans. Between 1965 and 1967, these motives and agendas briefly overlapped, and created a unique movement. A movement that liquidated itself in 1967, in a self-declared act of ‘auto-provocation’. In the exhibitions we staged in Amsterdam (2011) and in Brno (2012), we specifically follow the figure of Rob Stolk (1946–2001), one of the main founders of Provo. Coming from a socialist working class background, Stolk was involved in activism from a very young age. His involvement in Provo forced him to become a printer; since mainstream printing offices refused to handle the subversive and sometimes illegal Provo material, he had no other option than to print these publications himself. Reflecting on this situation, Stolk often quoted American journalist A. J. Liebling: “Freedom of the press is for those who own one”. After the liquidation of Provo, Rob Stolk remained an important figure in various post-Provo movements, most notably in the early squatters’ scene, and in Aktiegroep Nieuwmarkt (the action committee that successfully protested against the complete demolition of the Amsterdam Nieuwmarkt district and surrounding areas). In 1969, he was involved in the occupation of Het Maagdenhuis (the main building of the University of Amsterdam), operating a printing press from within the occupied building. Throughout the 1970s, he published the satirical/historical magazine ‘De Tand des Tijds’ (‘The Ravages of Time’). In the 1980s and 1990s, he became one of the most prolific cultural printers in Amsterdam, until his untimely death in 2001, when he was only 55 years of age. Our exhibition should be regarded as an incomplete archive, one that is intentionally subjective and biased. Moreover, it represents a view that’s very personal - after all, Marieke Stolk [one of the three members of Experimental Jetset] is Rob Stolk’s oldest daughter. By sketching of portrait of Rob Stolk (as printer, as designer, as activist, as organizer, as publisher), we tried to explore the notion of ‘the printer as auteur’, the relationship between activism and archivism, and the connection between the city and the printing press. 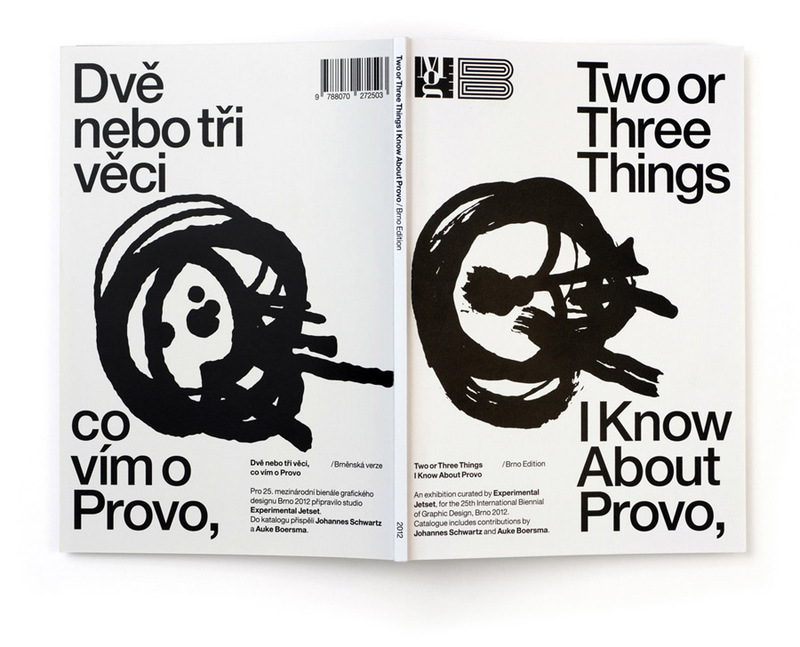 As we already wrote, the first edition of ‘Two or Three Things I Know About Provo’ took place in Amsterdam, between February 18 and March 13, 2011. Right after this exhibition ended, we were approached by Radim Pesko and Tomas Celizna , who asked us whether we wanted to guest-curate an exhibition as part of the 25th International Biennial of Graphic Design in Brno, which would take place during the summer of 2012. For a couple of reasons, we decided to use this opportunity to revisit the Provo exhibition. To be honest, a reprise of the Provo project certainly wasn’t the first thing on our mind. After all, would a subject such as Provo actually work outside the context of Amsterdam, and within the context of a graphic design biennial? After some thinking, we came to the conclusion that it could work, potentially. A big inspiration was the large Tropicalia exhibition that took place six years ago, at the Barbican in London. We visited that show in April of 2006, and the subject immediately grabbed us (resulting in a lasting ‘Tropicalist’ influence on our work, or so we like to believe). So we were thinking: if an exhibition on Tropicalia, a Brazilian movement from the ’60s, could have had such an enormous impact on Europeans like us – then why couldn’t Provo have a similar impact on people outside of Amsterdam? Obviously, our Provo project is of a completely different scale than that Tropicalia exhibition was – but the point we are trying to make is that we certainly thought that it could be worthwhile to address ‘local’ topics in ‘foreign’ contexts. The Moravian Gallery is huge – the space that was made available to us must have been five times the size of the space we had in W139. So for Brno, we reworked the exhibition in such a way that it would fit the new context. The exhibition in the Moravian Gallery consisted of the same 26 groups as we showed in Amsterdam; but for the Brno context, we added a large selection of original material. We also included a completely new part (an ‘appendix’), on the relationship between Prague and Provo, curated by Femke Dekker; and we presented all the texts in a different manner (in Amsterdam, we added the captions as separate leaflets, while for the Brno edition, we integrated the captions into the 26 groups, as ‘dazibao’-like posters). Also, the video program which we compiled for the Amsterdam edition, and which we showed in W139 during a one-night film festival, was for Brno included in the exhibition as a permanent feature. The first hall of the exhibition was the space where we showed the original material, mounted on the wall with frames. Next to these original pamphlets and posters, we wheat-pasted laser-printed sheets of paper, displaying the translations (both English and Czech), mimicking the compositions of the original material (the result was not unlike concrete poetry). In this hall, we also recreated the wooden constructions that we already displayed during the Provo exhibition in W139. In short, these wooden constructions functioned as a way to emphasize one of the main themes of the exhibition: the relationship between printed matter and the city. 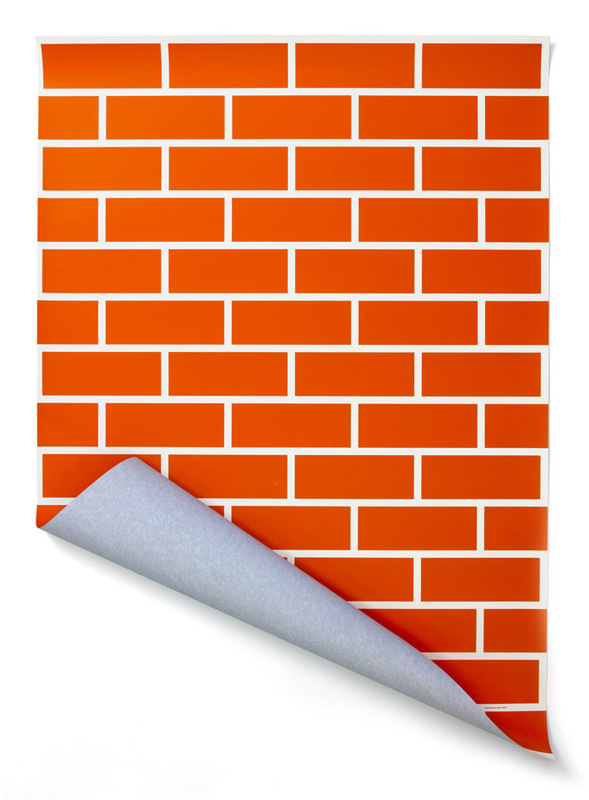 By ‘blowing up’ three motives which we saw as iconic for the three periods we wanted to describe (1965–1967, 1967–76, 1976–1983), we literally tried to turn printed matter into a city – an abstracted city, consisting of a wall (referring to the first few issues of Provo), a building (referring to the 'outlined house’ murals, which we came across in various publications from that period) and a billboard (based on the airmail-striped lay-out of ‘De Tand des Tijds’). In the following halls, we presented the 26 ‘groups’ of reproduced (photographed) Provo material (as A2- and A1-sized prints), organized according to theme, and ‘numbered’ A to Z. Accompanying these large prints were A2-sized captions, in both English and Czech. All the other accompanying texts (the main introduction, the interviews, etc.) we printed on A0-sized sheets, which we used throughout the exhibition as ‘daziboa’-style posters. 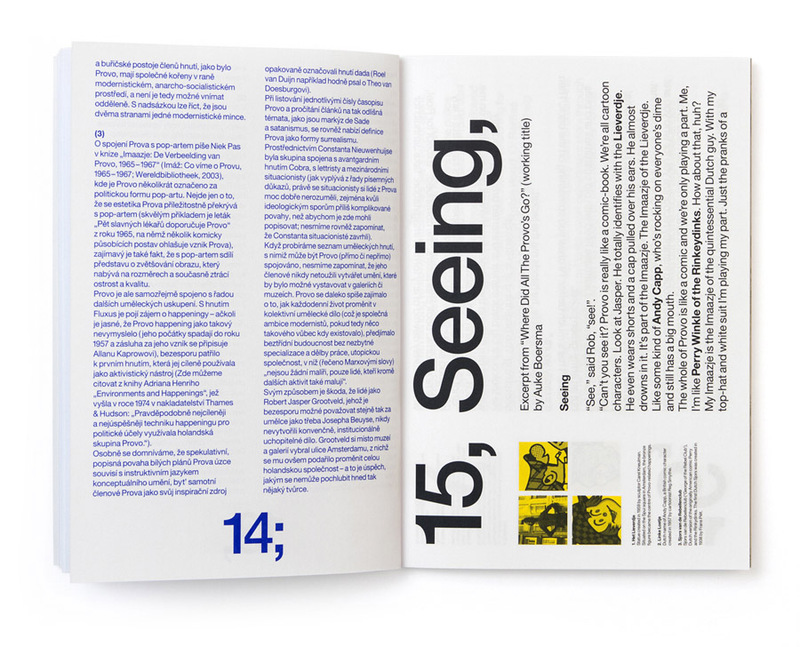 (In the original W139 exhibition, we distributed these texts as mimeographed pamphlets, but for Brno, we thought it was easier to have these texts on the wall). For this exhibition, we also designed a brick-wall print (screenprinted by Wyber Zeefdruk), which we used as a wallpaper all throughout the exhibition. 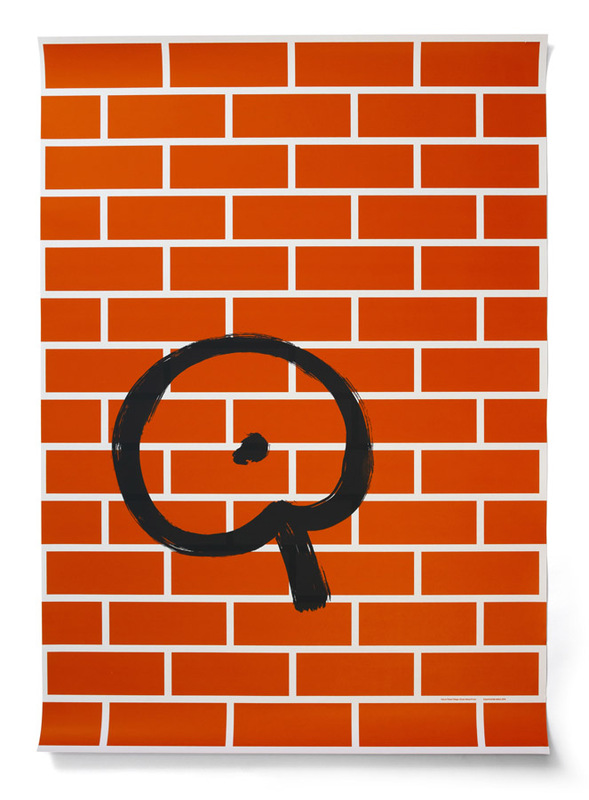 The brick-wall-pattern refers to the first few issues of Provo (the magazine of the movement), which were published in covers featuring brick-patterns. In fact, for these covers, Provo used a special sort of brick-pattern dollhouse wallpaper – so we thought it would be a nice gesture to ‘blow-up’ this dollhouse wallpaper, and enlarge it to actual-size proportions. The way in which we used the brick-wall-pattern is again an attempt to underline the relationship between the city (the ‘built environment’) and the printing press. We thought it would be interesting to dedicate a section of the exhibition to the relationship between Provo and the Czech Republic. So we commissioned freelance curator (and good friend) Femke Dekker (of My Little Underground) to explore possible links between the Amsterdam movement and the former Eastern Bloc. The result proved to be incredibly interesting: as Femke Dekker discovered in the archives of the International Institute of Social History (IISG), the Prague group Aktual had strong ties with the Provo movement – and in 1966, Aktual even organized a combined Fluxus/Provo exhibition in Prague. The results of Femke Dekker’s small research project were presented as a separate chapter, almost like an ‘insert’ or ‘addendum’ to the exhibition. This section included (among other items) a cloth patch from the Aktual movement (on loan from the IISG), some sound recordings of Aktual’s musical output, and a previously-unpublished letter (translated in English and Czech) in which Provo-member Peter Bronkhorst describes his trip to Prague. During the opening conference of the Brno Biennial, one of the speakers was actually Milan Knizak, one of the main founders of Aktual (and who would later become the head of Fluxus East). We were flattered that Knizak agreed to do this lecture. We were asked, by the organizers of the Brno Biennial, to also produce a small catalogue to go with the exhibition. In fact, we really wanted (and we still want) to turn the exhibition into a large publication. 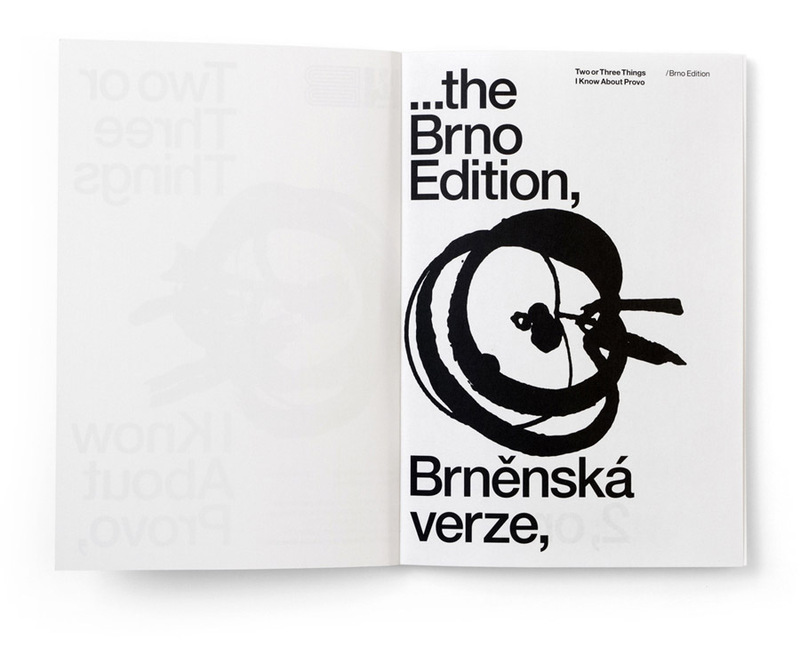 But around the time of the Brno exhibition, we simply didn’t have the time to work on such a monumental book. So rather than producing a complete catalogue, we decided to keep it humble, and to just design a small booklet, as a sort of ‘extra chapter’ that could be added to the exhibition as a whole. This booklet was published by the Moravian Gallery (as part of an ongoing series of biennial catalogues that has been running since 1963). The main part of the booklet consists of a short story written by Auke Boersma, a former member of the Provo movement. In this (previously unpublished) story from 1983, Boersma recalls the early days of Provo in an almost Pop Art way, comparing key members of Provo with vintage comic characters, while describing a surreal ‘dérive’ through the city of Amsterdam. 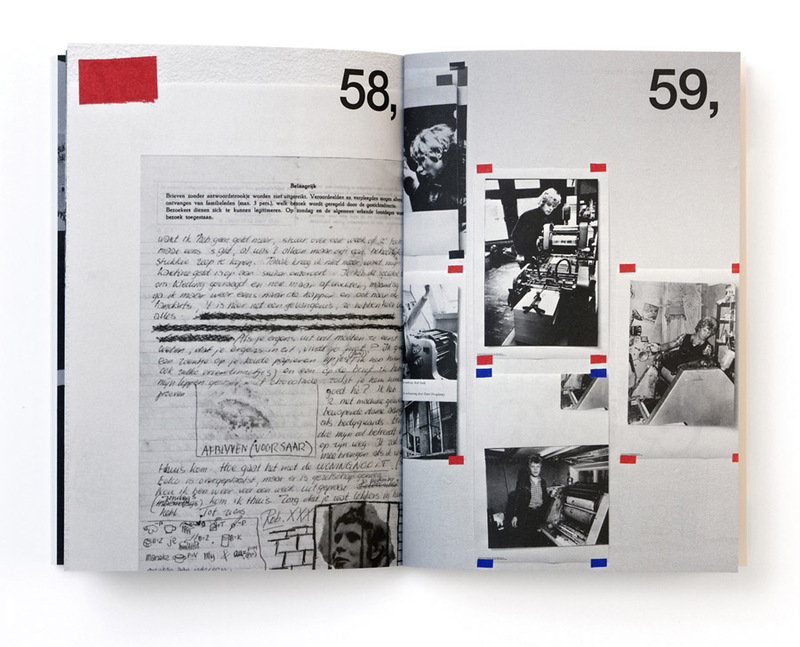 Further included in the booklet is a 24-page section of photos by Johannes Schwartz, documenting the first edition of the exhibition, as took place last year in Amsterdam. There’s also a foreword by ourselves, as well as an afterword by Marek Pokorny, director of the Moravian Gallery. Bilingual (English and Czech), A5-sized, 64 pages, offset-printed (by a Czech printer called Metoda Spol) in an edition of 700, the booklet is still available through the Moravian Gallery. We have to admit that we couldn’t control the printing as much as we wanted to (we were simply too busy, working on the exhibition itself). The cover turned out to be laminated – while we actually wanted the cover to remain uncoated. But oh well – such is life. 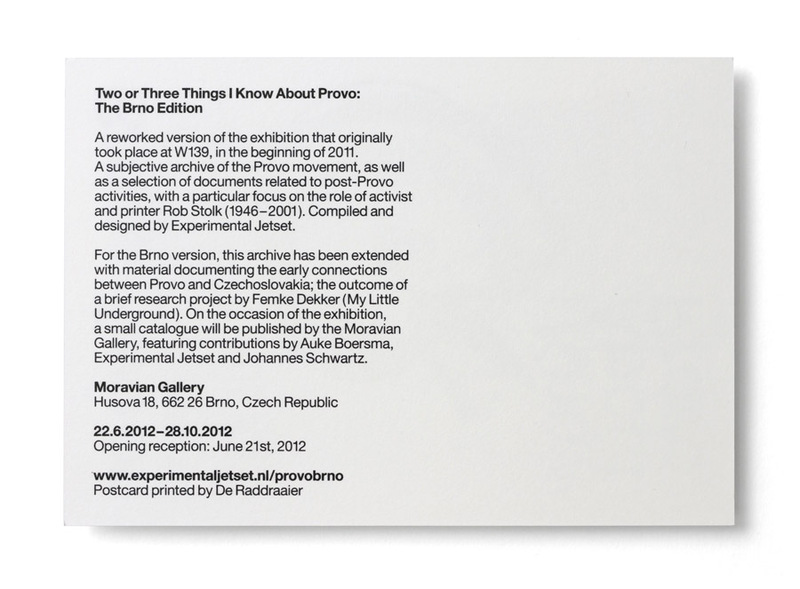 Another piece of printed matter we designed for the exhibition was this series of three different invitation cards (A6-sized, two-sided, offset-printed by De Raddraaier). The front of these post-cards featured the so-called ‘Gnot Apples’, while the back displayed general information about the exhibition. (In fact, one of these cards came in two versions – a version featuring general information, and a version featuring more specific information about the opening reception). Maybe it’s interesting to explain the design on these cards. For the Provo exhibition that took place in 2011, we designed a poster displaying a ‘typology’ of different variations on the ‘Gnot Apple’ (the unofficial ‘logo’ of Provo, originally conceived in 1962 by Robert Jasper Grootveld and Bart Hughes as a symbol of Amsterdam as ‘Magick Centre’), scanned from different sources, through which we tried to illustrate the idea that there exist many different possible interpretations of the history of Provo. 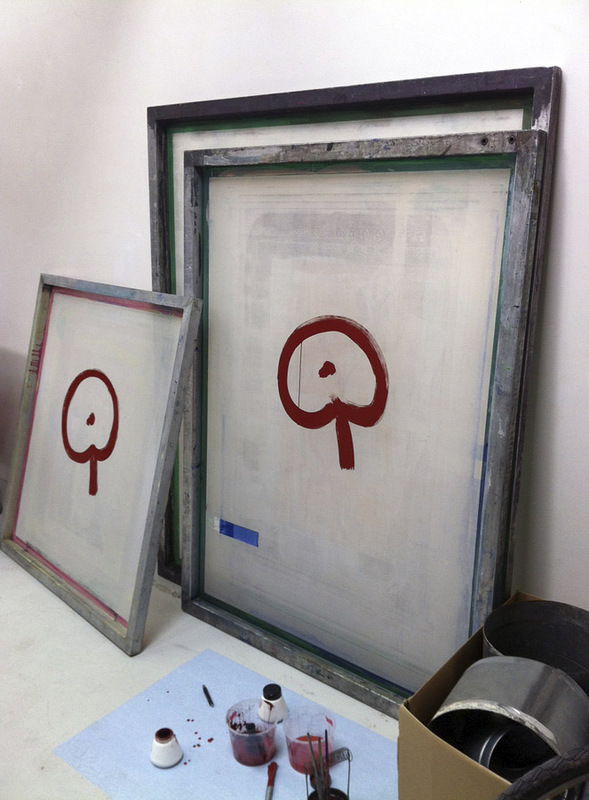 For the 2012 exhibition, we took these ‘Gnot Apples’, and placed them on top of each other. The idea behind it is that, despite the fact that there are many different subjective histories of Provo, there always will be a part where these different interpretations overlap; a ‘common ground’, so to speak. 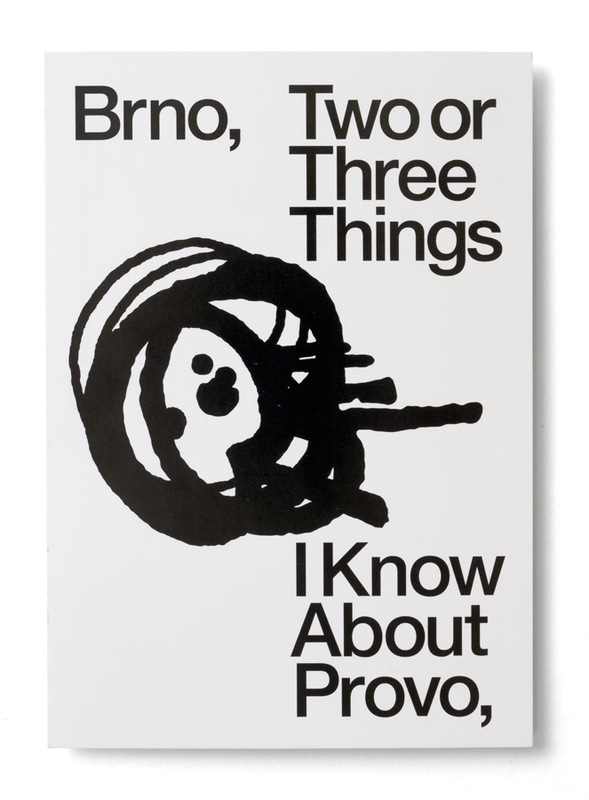 And that concludes the story behind ‘Two or Three Things I Know About Provo / The Brno Edition’. True, there was also a lecture we gave during the opening symposium of the Brno Biennial, and a guided tour we gave in the space, but we have to admit – we were so tired after the installation of the exhibition, we messed up all public events that took place after that. For which we apologize! An old press-release of the first Provo exhibition (the one in 2011) can still be found here, while the press-release of the second exhibition (in 2012) can be found here. After the opening of the exhibition, we were interviewed by the bilingual (English/Korean) magazine Graphic. 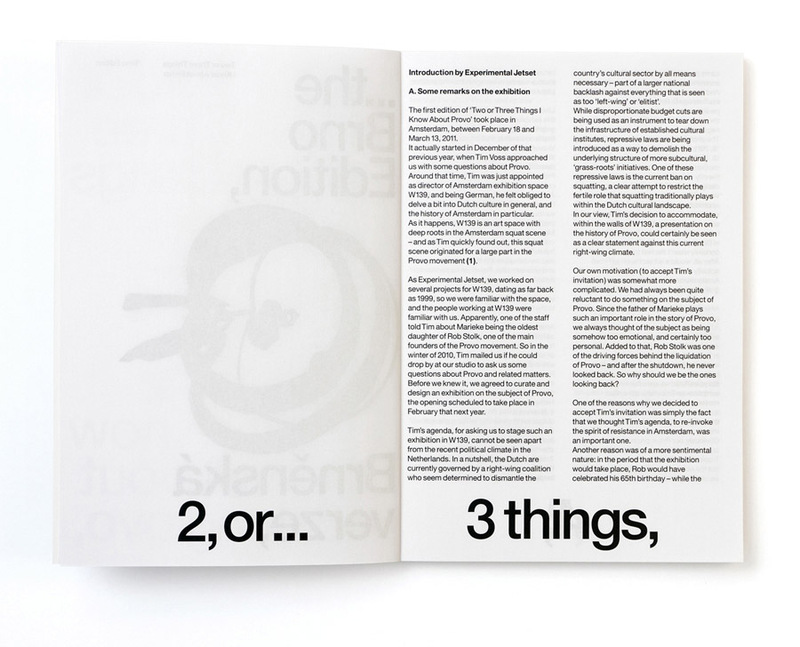 The resulting article was published in issue 24 of Graphic. The text of the interview can be found elsewhere on our website. All the above pictures of the exhibition (the ‘installation views’, so to speak) were either photographed by ourselves, or by the Moravian Gallery (courtesy of the Moravian Gallery archive). People who want to learn more about the history of Provo should definitely check out Richard Kempton’s ‘Provo: Amsterdam’s Anarchist Revolt’ (published in 2007 by Autonomedia), and ‘Imaazje: De Verbeelding van Provo, 1965-1967’ by Niek Pas (published in 2003 by Wereldbibliotheek). That latter book (‘Imaazje’) is a fantastic source of information, and very well-written; but unfortunately, it’s out-of-print, and only available in Dutch. It’s a shame really – it really deserves to be translated in English, and reprinted. Foreign publishers, take note! By the way, the largest archive of Provo-related material can be found at the International Institute of Social History (IISG) in Amsterdam. They have a collection of 6 meters worth of boxes and files, filled with documents and printed matter, free to consult by the public. For us, it’s good to know that this archive exists, so we don’t feel obligated to represent some sort of ‘objective truth’ in our own exhibition. If people dislike our interpretation of Provo, they can always check the original sources (at the IISG), and reconstruct their own view on Provo. Antiquariaat Boek en Glas, Auke Boersma, Pieter Boersma, Femke Dekker, Jan Donkers, Henk & Veronica van den Dungen, Hugo van Heijningen (Red Light Radio), IISG (International Institute of Social History), Suzanna Jacobs-Stolk, Cor Jaring, Orpheu de Jong (Red Light Radio), Ad Leeflang, Anna Leeflang, Loe van Nimwegen, Niek Pas, Jan Pen, Huub Prickaerts, Otto Schuurman, Johannes Schwartz, Reina Stolk, Sara Stolk-Duys, Swip Stolk, Tjebbe van Tijen, Tim Voss, W139. Gerard van den Berg (+), Auke Bijlsma (+), Willem Breuker (+), Peter Bronkhorst (+), Steef Davidson (+), Rob de Groot (+), Robert Jasper Grootveld (+), Hans Tuynman (+), Tine Hofman (+), Jaap de Jong (+), Rob Stolk (+). The staff at the Moravian Gallery and the Brno Biennial (in no particular order): Marek Pokorny, Radim Pesko, Adam Machacek, Tomas Celizna, Yvona Ferencova, Jan Sladek, Alena Benesova, Miroslava Pluhackova, Petra Trtilkova, Petr Kolaja, Svatopluk Masa, Milos Merinsky, Adela Janekova, Katerina Pacikova, Veronika Pacikova, Martina Vaskova, Pavlina Vogelova. All items displayed in the exhibition were from our own collection, except when noted otherwise. Other collections were specified as follows: SDS = Sara Stolk-Duys, RDG = Rob de Groot, AL = Ad Leeflang, IISG = International Institute for Social History.